Welcome to Eziko – A unique Township Experience! Eziko in Xhosa is ‘hearth’ which is considered an interal part of the home, centrally located where family and friends would gather. Thus, an appropriate name for Eziko as it is where friends in the community and visitors alike meet to share good food and conversation. 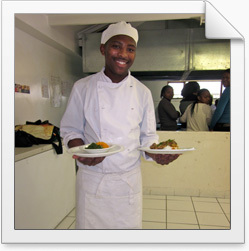 Eziko comprises of the Eziko Cooking and Catering School and the Eziko Restaurant. The school helps to provide the unemployed with vocational skills and therefore employment opportunities in cooking, catering and hospitality. The restaurant offers the students first hand experience of working in the catering industry. No matter if you choose a meal or a coffee, you will feel the hospitality of the township and contribute to make a difference to someone’s life - so please stop by and experience a Taste of Africa!